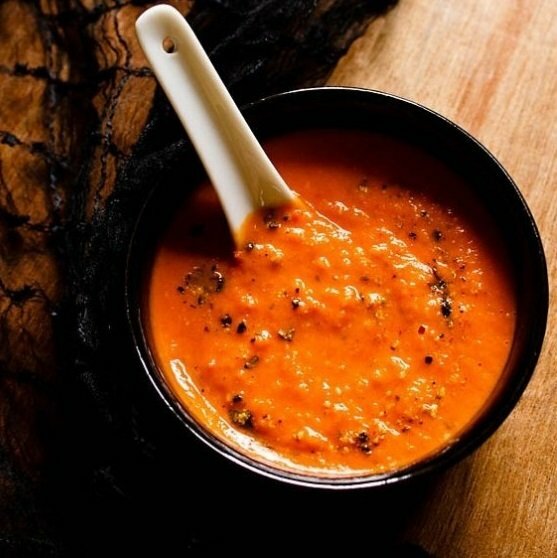 roasted tomato soup recipe - easy and tasty soup recipe with roasted tomatoes. 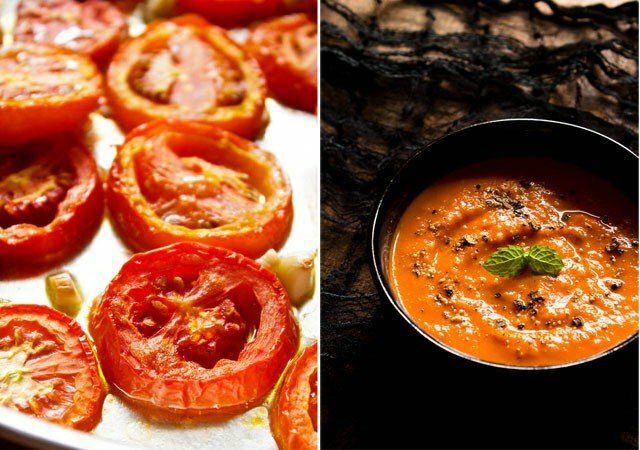 roasted tomato soup recipe with step by step photos. tomato soup is an all time favorite of mine. 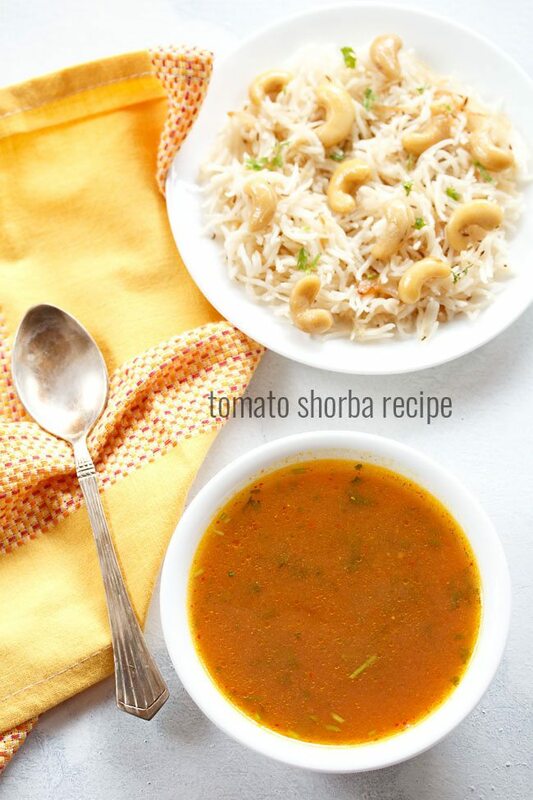 in this soup recipe, the tomatoes are roasted. there is another restaurant style tomato soup recipe on the blog where the tomatoes are not roasted but blanched. for the first time when i made this roasted tomato soup, i loved it for awesomeness. after that, i have made this roasted tomato soup many times. roasting the tomatoes lends a warm, earthy flavor to the tomatoes which you won’t get in the regular tomato soup. 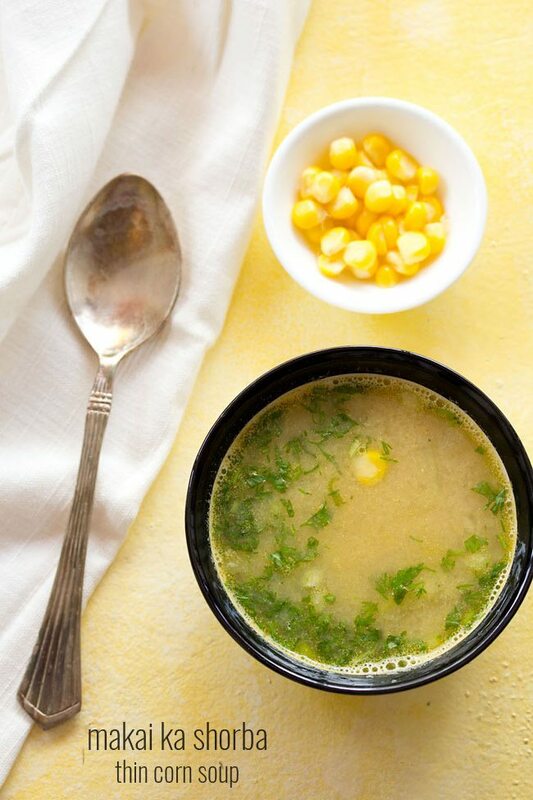 this soup recipe is very simple and easy. 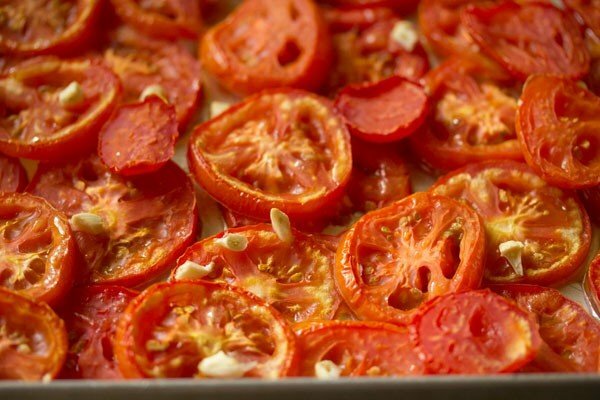 the tomatoes are sliced and then roasted in the oven with some garlic and olive oil. along with the roasted tomatoes, the juices of the tomatoes and garlic with the olive oil is then pureed. add a dash of pepper and salt and the soup is ready. easy and no cooking on stove top involved. a simple & easy tomato soup that can be had with some warm bread or baguette. if you don’t like garlic, then just make the soup without garlic. 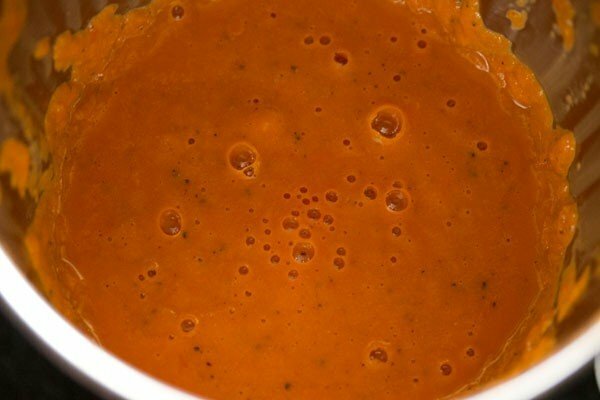 the roasted tomato soup recipe is adapted from ehow. for any tomato based dish like a soup or gravy, its always better to use ripe red tomatoes. so that you do not get very sour tasting soup or gravy in the end. rinse the tomatoes in water. 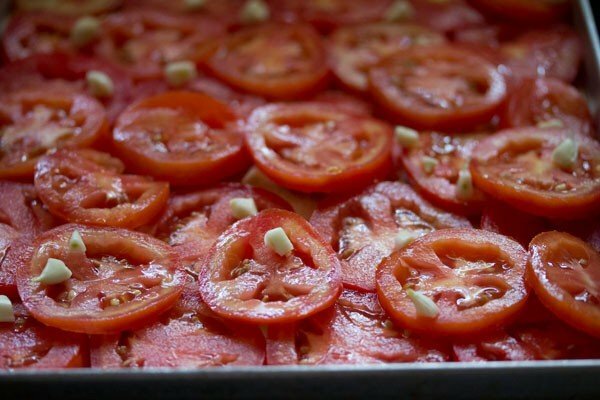 now slice the tomatoes and place them in a baking tray. add chopped garlic also in the tray. drizzle the olive oil evenly on the tomatoes. roast in a preheated oven at 180 degrees C for 25-30 minutes or till the tomatoes have shrunk in size & got golden. 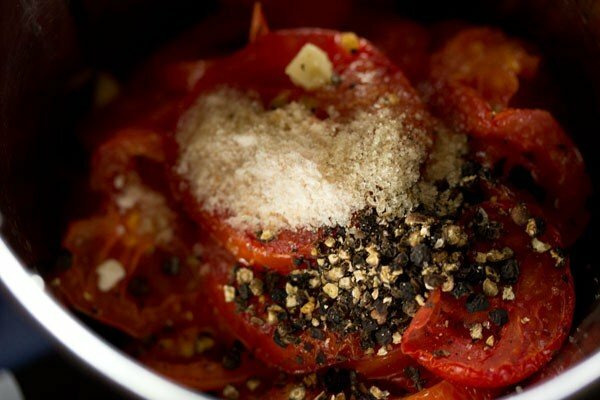 when the roasted tomatoes are slightly hot or warm, add them in a blender along with the garlic and all the juices and oil from the tray. add some crushed black pepper, salt and sugar to the blender. 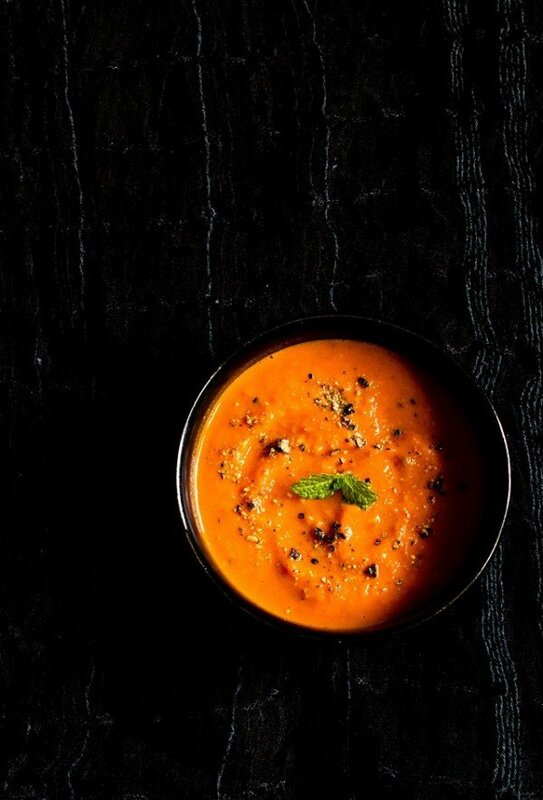 add warm or slightly hot water and blend to a smooth puree. pour the soup in serving bowls. garnish tomato soup with mint or cilantro or cheese or cream. 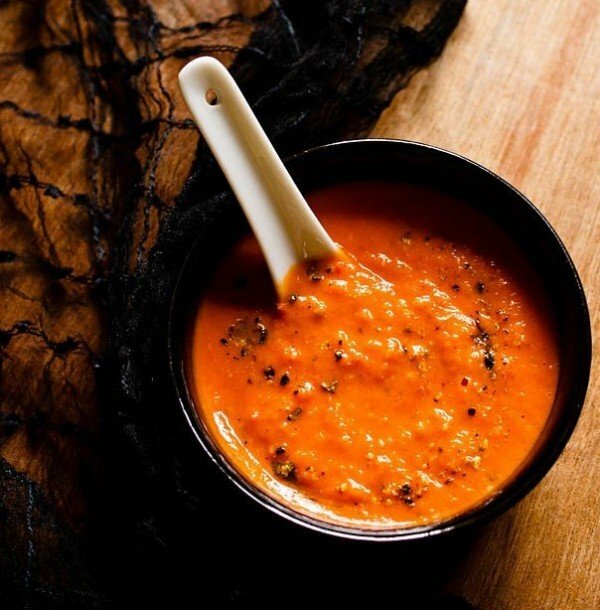 serve roasted tomato soup warm or chilled. the addition of warm water is optional. if the tomatoes are juicy, then you don't need to add any warm water. again adding sugar depend on the sweetness of tomatoes. if the tomatoes are sweet, then you don't need to add any sugar. best to use ripe red tomatoes. 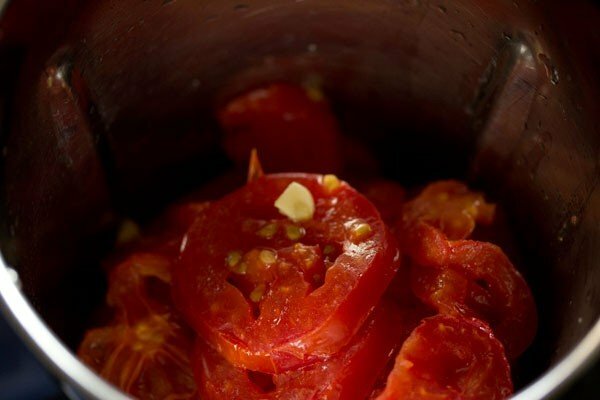 1. rinse 4 to 5 large tomatoes (530 to 550 grams) in water. now slice the tomatoes and place them in a baking tray. add 6 to 7 medium sized garlic (chopped) also in the tray. if you do not prefer a garlicky flavor, then you can skip garlic or reduce their quantity. 2. drizzle 2 tbsp olive oil evenly on the tomatoes. 3. roast in a preheated oven at 180 degrees C for 25-30 minutes or till the tomatoes have shrunk in size & got golden. 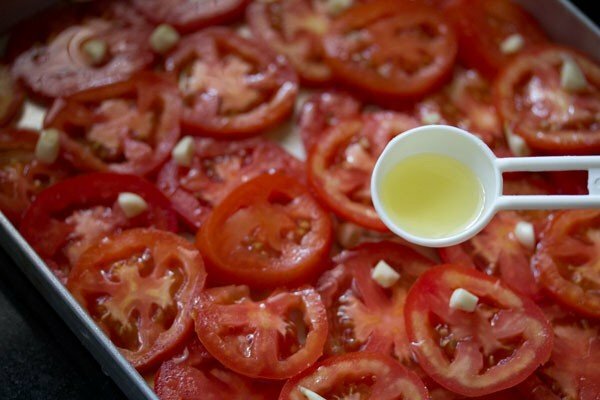 4. when the roasted tomatoes are slightly hot or warm, add them in a blender along with the garlic, the juices and oil from the tray. 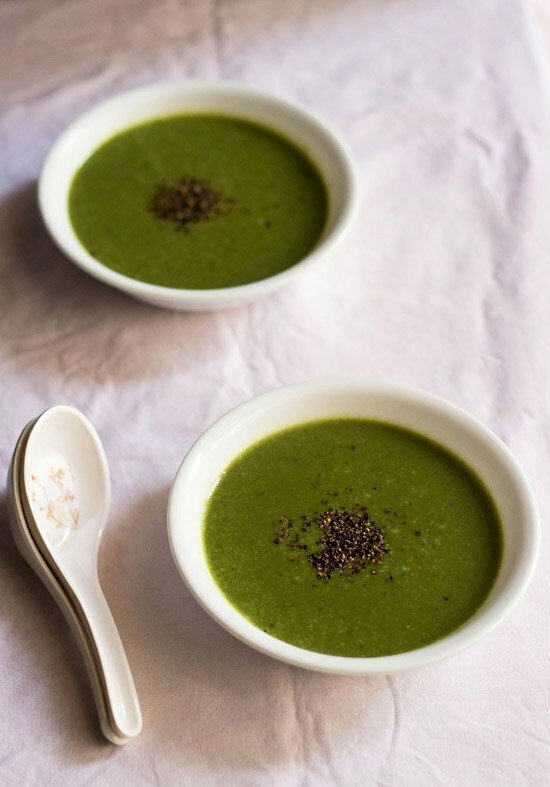 5. add some crushed black pepper (½ to 1 tsp or as per taste), salt and sugar ( ¼ tsp or according to taste) in the blender. adding sugar depends on the sweetness of tomatoes. if the tomatoes are sweet, then you don’t need to add any sugar. 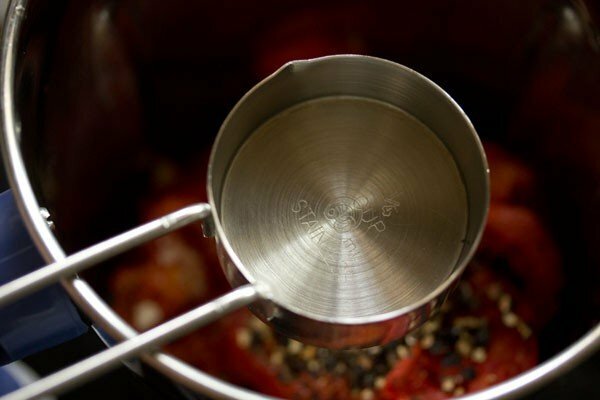 6. add ¼ to ½ cup warm or slightly hot water. 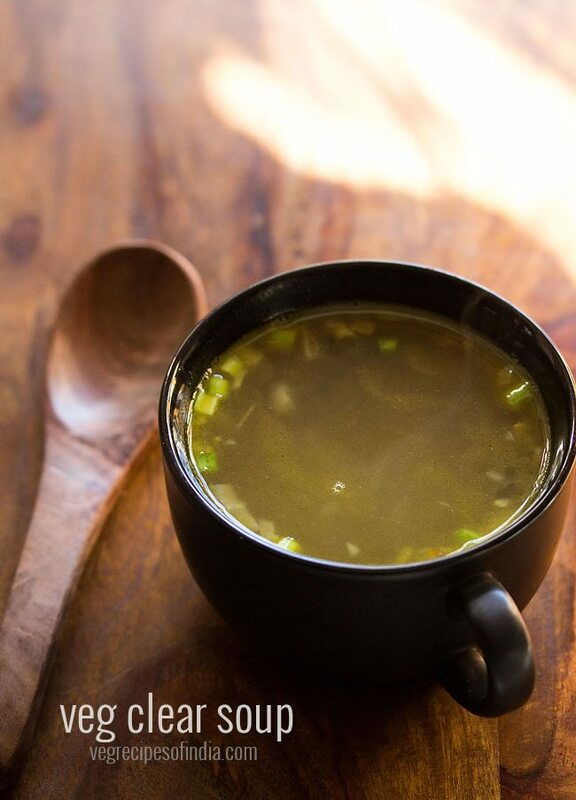 for a thicker soup you can add less water and for a medium consistency, you can add more water. if the tomatoes are very juicy, then you don’t need to add any warm water. 7. blend to a smooth puree. check the seasonings and add more black pepper, sugar or salt if required. 8. pour the roasted tomato soup in serving bowls. garnish the soup with mint or cilantro or cheese or cream. 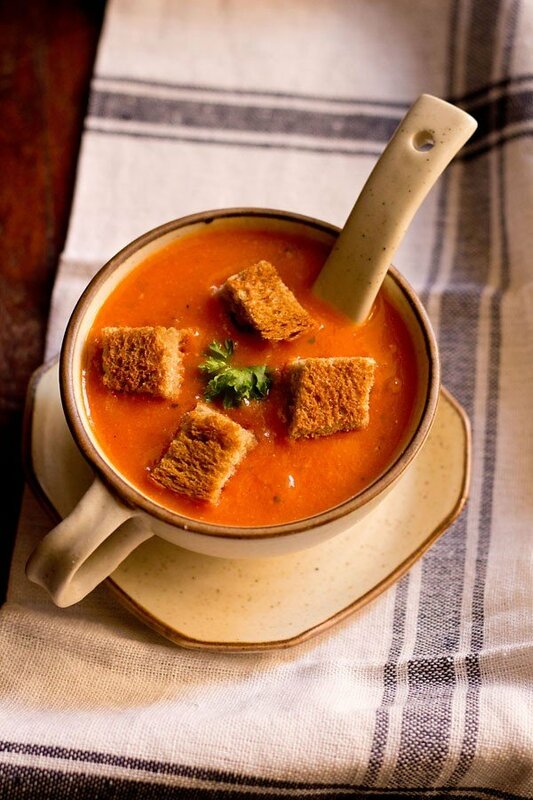 serve roasted tomato soup warm or chilled. the recipe serves 2 and can also be increased proportionately to 4 or 6 servings. thanks kriti. you can use a mix of cherry tomatoes and regular tomatoes. cherry tomatoes are on the sweeter side. so when used with regular tomatoes, there will be a balance of tanginess and sweetness in the roasted tomato soup recipe. so you can use 300 grams of tomatoes and 250 grams of cherry tomatoes. you can even use half-half of each. in fact you can even try making soup with cherry tomatoes only. but it will be like an experimentation. I love this recipe. I’m usually very busy during the week due to be a teacher at a boarding school. This meal is the perfect meal after a long day or even a late day when I may get home after 7pm. Add a grilled cheese sandwich and it’s heaven. I will also add some dried basil to give it some oomph. Thanks for the share. thanks kat. agree with you. basil goes very well. i also make basil tomato soup. 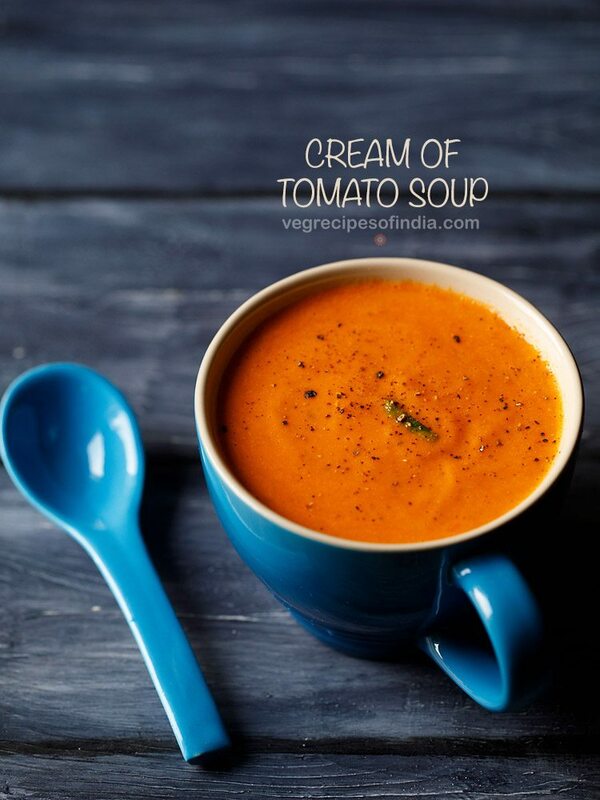 though i have not added the recipe and basil does wonders to a simple tomato soup. The measurements came out wrong for me. I weighed the garlic and tomatoes. One clove of garlic weighed 4 grams, and three tomatoes weighed 563g. I ended up using three tomatoes and 2 garlic cloves based on weight. sky, it depends on the size of the veggies. an indian variety of large tomatoes cannot be equaled to the tomatoes or garlic one gets in western countries. thats why i give the weight in grams too. good to know that you used the weight measures. and i hope you liked the soup.